Not listening to customers is not the only mistake which may have irrecoverable effect on your business. Inefficient customer service when most part of time is spent arguing with customers will also lead to unsatisfied customers. Treating customers without any respect and leaving their issues unresolved is the fastest way to become “famous” for the most terrible customer service. In order to satisfy customers, companies have to keep up with the latest technological advances and train their staff or suffer the consequences. By introducing an efficient customer service strategy your business will have not only positive feedback but will also earn trust and customer loyalty. Social media is growing in popularity as an avenue for frustrated consumers to talk about their customer service experience publicly. Instead of contacting the company directly and complaining your customers will go to the masses and share what they think about your brand. When you do not receive complaints this also does not mean all your customers are happy. According to Lee Resource for every customer complaint there are 26 other unhappy customers who have remained silent. Your customers’ silence is deadly for your business not only because you have lost the lifetime value these customers bring to your business but because of the impact these customers have on your potential prospects. When your customers complain they give you a unique opportunity to fix the issue and do whatever you can to win those customers back and prevent that issue from happening in the future. An ability to post complaints empowers your customers to make your company better. Whenever you put all your efforts into providing a fast resolution to any complaint, you satisfy your customers’ needs and let them become your brand evangelists. Poor customer service has a negative impact on any type of business. However, small businesses which rely on repeat sales and positive feedback for their success are affected most of all. While large corporations can exist with this and have new customers instead of those who have left, small companies will lose their market share. 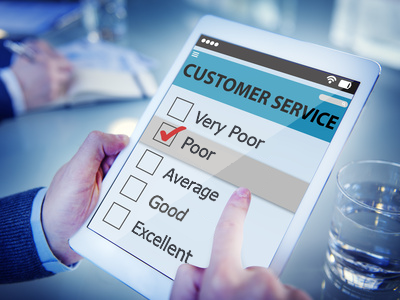 So what happens to companies which deliver poor customer service? If you made a mistake do not be afraid to take responsibility and provide a fast solution. A proactive approach in this case and efficient customer service will help to solve the issue and win customer’s loyalty. And such little things as a sorry note, present or additional discount will form a positive rather than negative customer experience. Offer a quick resolution to any complaint, do not leave negative feedback or complaint unresolved. Treat your customers with respect. Train your customer care team to treat each customer with respect and take into account all their needs and requirements. If you have got examples of poor customer service or recommendations to those companies which would like to improve their customer service, you are welcome to share your ideas in the comments to this blog post. This entry was posted in Articles, Infographics and tagged customer service, poor customer service. Bookmark the permalink. I need help responding to my CS reps that complain loudly when customers add non-standard work requirements. Additional forms or uploads , color or no color on invoices- etc. can be somewhat petty but the customer writes our paycheck. Any words of wisdom? Can you elaborate on your comment “take into account all their needs and requirements? always? Thank you for your comment, Kit. Let me also ask you – is this something that takes much time and effort or your CS agents just do not want to do the job they think is out of their scope? If this is smth they can easily do then why not? Your customers purchase on your store and to win their loyalty and see repeating purchases you need to go an extra mile. Just discuss this with your team, make a brainstorm and choose the right strategy where both your employees and customers will be happy. It’s important for businesses to take into account needs and requirements of customers, otherwise they will look for another shop where their needs and requirements will be takes into account. This is an axiom of today’s business. If you treat a customer well, he will tell two people. If you treat him poorly, he will tell ten people. It’s difficult to nail down a bad customer service definition, but a customer who had a negative customer service experience often point to things like speed of service and having to explain their issue to multiple agents. Haven’t seen the 3R rule before — thanks, will use it!! I am currently in the process of building an online retail brand with my partner and found this article really interesting. How would you tailor the effectiveness of great customer service to a startup eCommerce? Thank you for reading my article, Dominique. I am glad you liked it. You are right, we learn every day. And I’d like to add that we should not stop on what we have achieved. Great post Olga, we’ve shared it on our social channels! At QuickTapSurvey we find that companies usually have the right intention, but are not quite sure how to begin. We ask them this: how can you know what your customer’s expectations are, unless you ask them?! A person necessarily assist to make seriously posts I might state. This is the very first time I frequented your web page and so far? I surprised with the analysis you made to create this particular submit incredible. Excellent process! Thank you for reading our blog articles, Dalton. Am a P.Attendant so would like to recommend you for your excellent ldeas towards Customers Excellence Services because most of the BP Dealers are having problems with customers due to poor customers services hence competetors are winning the customers. Thank you for recommending this article, Willie. I hope it will help to improve customer service. I appreciate your article, customer satisfaction is very important as searching for new prospects and customers. We are in the business of software application development and we know how fast technology is changing and new gadgets coming in the market. We always try to build customer-centric atmosphere and deliver best support and solutions. Nice article Olga. Though customer satisfaction is an important and detrimental aspect of any service but is there any way, where we can limit the implications of bad performance in services. For example, in manufacturing sector, we limit liquidated damages of a bad product to 5 or 10%, but in services these damages are getting into ripple effect and a small mistake in services may result into big damages. Any thoughts on this aspect. Thank you for your comment, Vijay. I totally agree with you that a small mistake may lead to major losses if a company is service provider. However, poor customer service will cost more. Especially if companies cannot support their customers in cases of unforeseen circumstances like DDoS attacks, etc. well its so true about poor customer service.If i can say treat people with respect and then you will get respect back.Also sometimes the customer don,t have people to speak to and maybe they feel more comfortable with you, take some time to listen to there problems and not jump nothing will be solve. I agree with you Sharon, it is important to listen to your customers and treat them the way you would like to be treated yourself. Thank you for your comment. I have a question? what challenges does a company have due to unsatisfied customers. Here is a great article which will answer your question about challenges that businesses have due to unhappy customers. first of all, I would like to thanks for information on blog…my name is Andre. i would like to make a part of your blog and publish some of my article if is possible, and i will appreciate it. We accept guest posts, please contact us by email [email protected] regarding this. Your customer decides whether your product is a success or a failure. Always listen to the feedback from your customers and work towards the direction to improve the response results. We loved this post and agree that customer satisfaction and even experience is really important for any business. It’s important to listen because a customer happy or unhappy always have something to speak. It’s always better to have that information by your side to make it useful in your business growth. We would like to refer this blog from one of our existing blogs.